When most people are excited about getting ready for that first year of college, Rufus Dorsey found out he was type 1 diabetic. While in high school, Rufus played sports including football that landed him a scholarship to college. One month before he headed off to college, Rufus was diagnosed with diabetes. Getting this diagnosis made Rufus depressed, suicidal and ashamed. Rufus says he felt damaged. No longer could he eat cheesecake, candy, ice cream just like other teenagers instead he was going to have to change his whole lifestyle. Rufus would now rely on regular insulin shots to keep him healthy. Rufus credits his mother for challenging him to live his life to the fullest. She encouraged him to stay in college, play football and graduate. His mother also said he had the ability to help inspire other people with his battle. Rufus has also started a health and wellness company called D Force. The letters in the company’s name all have a meaning behind them. The D stands for dynamic. The F stands for Face your Challenges. The O is for Own your Health. The R stands for Remembering regular checkups. The C stands for Choose healthy foods and the E stands for Exercise. 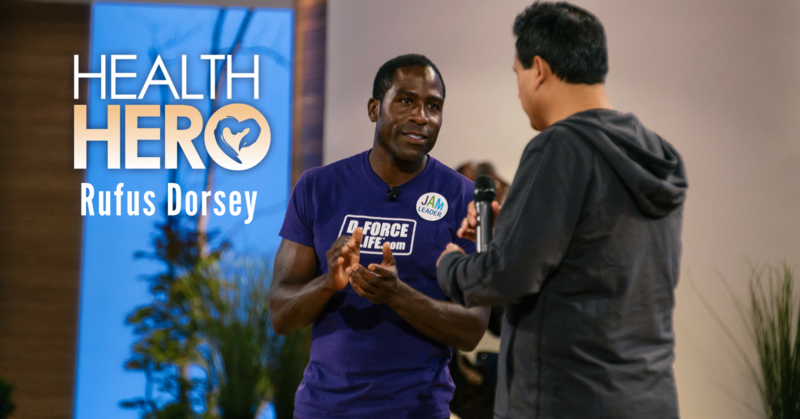 Rufus also takes time to share his story and help to inspire others to find their own way and because of this, Rufus Dorsey is this week’s Health Hero. Learn more about Rufus by visiting his web page D-FORCE for LIFE.